Los Angeles saw some interesting retail investment sales in February. 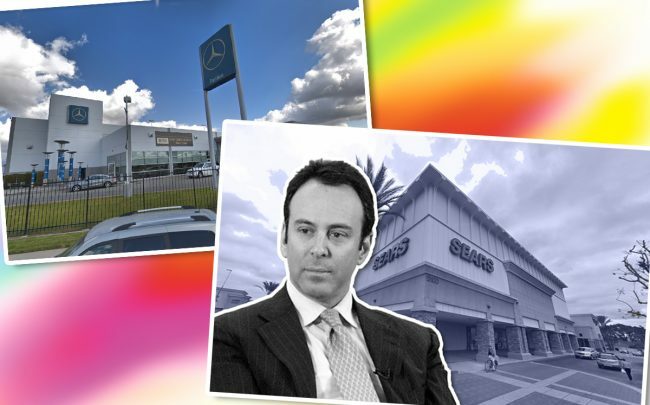 Among the top trades of the month were the sale of a defunct Sears store in Long Beach to Eddie Lampert’s hedge fund, ESL Investments and a deal for three auto dealerships in West Covina. The auto dealer was the top sale of the month, at $61.2 million. Overall, the top five sales tallied a combined $134.6 million, a big jump from January’s $80 million. December was even lower at $46.4 million. On Venice Boulevard, LaTerra Development also picked up an aging shopping center its likely to redevelop into a multifamily asset. In two sales, auto empire scion Roger Penske Jr. offloaded three Mercedes-Benz auto dealerships in West Covina totaling 390,000 square feet. The buyer was Ayman Sarriedine, the owner of a Mercedes-Benz dealership in Escondido, who could be looking to expand into the L.A. area. Penske Jr. purchased the three properties — 1829, 2010, and 1016 E. Garvey Avenue — in 1997 for $3 million each. Penske Jr. is the son of auto racing legend Roger Penske and brother of Jay Penske, who’s been in real estate headlines lately for his struggle to redevelop a church property in Venice. Catellus sold this retail center in South Gate to Acacia Capital, a private investment firm based out of San Mateo. Tenants include an ALDI supermarket, AT&T Store and a number of restaurants, including Panera Bread and Tacos Gavilan. The park is part of a larger retail hub off Interstate 710, running from Long Beach to near Alhambra. Neighbors include a Sam’s Club, a Target, and a McDonald’s. This shopping center at the corner of Bundy Drive in Sawtelle totals 31,500 square feet. Tenants include a Marukai grocery store and a Party City party supply store. Merlone Geir is an active L.A. retail investor based in San Diego. The firm purchased the property from the Jerry and Nancy Goldman Family Trust. Merlone Geir is redeveloping the 25-acre Laurel Plaza Shopping Center in North Hollywood and in January inked a lease with Trader Joe’s for a 15,900-square-foot space at what will become NoHo West. Not far from Merlone Geir’s new property on Pico Boulevard, LaTerra Development picked up a 16,400-square-foot retail plaza. Tenants at the two-story center include a pizza shop, a bicycle repair shop, and a beauty salon. The seller was Crimson Holdings, a private investment firm with offices in L.A. and San Francisco. The property is an unusual choice for LaTerra, which almost exclusively develops multifamily properties. The firm is developing a pair of mixed-use projects in East Hollywood, as well as a 71-unit development to replace a car wash in Santa Monica. This sale is part of the wider shuffle of properties and assets between what remains Sears Holding Corporation and ESL Investments, the hedge fund of former Sears CEO Eddie Lampert. In January, ESL successfully bid $5.2 billion for the former retail giant’s remaining assets, which included around 425 stores nationwide. Lampert said ESL will sell or sublease some of those properties, so the fate of this Long Beach location remains unknown. It’s part of a large retail center. Next door there is a T.J. Maxx, L.A. Fitness gym, and a Lazy Acres grocery store.